It always comes back to short term pain for long term gain. But does it have to? Maybe you can enjoy the gain without the pain. When it comes to entertainment, most of us spend more than we realize. I always encourage everyone to track their income and expenses because that’s the only way to truly know where our money goes. When I did it, I was surprised at my numbers, just like my clients are always surprised at theirs. The thing is, once we know the numbers, then we feel we have to change them, and that’s the scary part for a lot of people. So let’s make it less scary. What I usually hear is some version of, “I want to save money, but I’m not going to give up my social life to do it.” I hear you. I didn’t want to give up my social life, either. That’s why I found a bunch of ways to have fun for less money. Now I find that I can have a ton of fun for a lot less money, and that’s more money that can go right into my nest eggs. 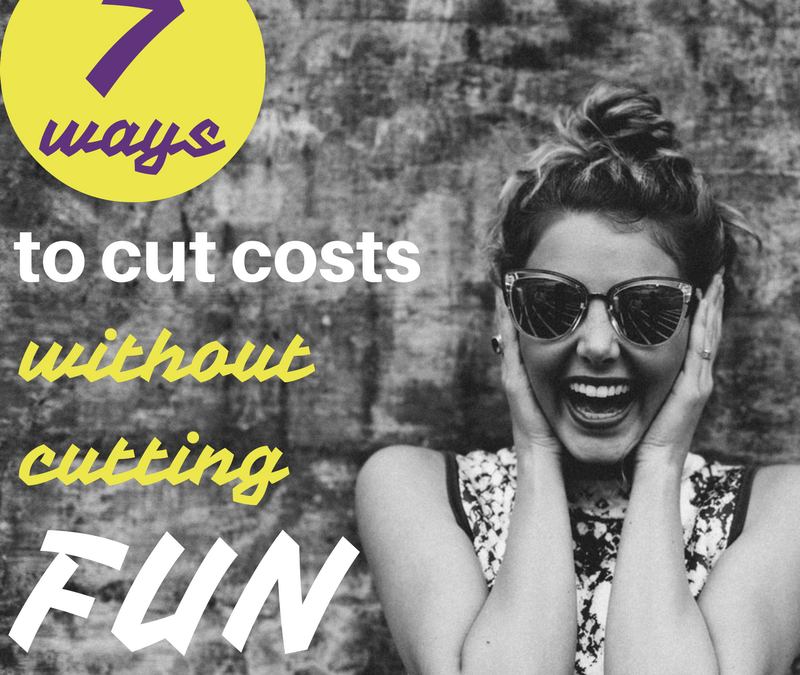 Try of few of these for yourself and see how much you can save while still having fun! The costs below do not include transportation costs, so just add those in for your own situation. A fancy night out can be fun, but so can a relaxed night at home with friends. Invite some friends over for an activity. Provide some snacks, or maybe don’t, and enjoy each other’s company. The other night I went to a friend’s house for a rousing night of Settlers of Catan. There were three of us, all old friends who are comfortable with each other, so sometimes we make it super casual. The other night I went in yoga pants and no bra (heaven!) and brought some chocolate I had around the house. We ate, we laughed, we got mad at the dice, and we had a fantastic time. It was so much better than sitting quietly in a movie theater. I’m not what you would call an active person. Ok, I’m a couch potato. But even I like to get outside sometimes. Sitting by the ocean and watching the waves or taking a walk through the woods are some of my favorite things, whether I’m alone or with someone else. Sometimes I’ll just read a book in a park. Swimming, sledding, biking, and hiking are all free. Camping can be free or inexpensive, too. A picnic in the park or tossing a frisbee are great ways to spend an afternoon. Brainstorm a bunch of activities for each season and you’ll always have something fantastic to do outside. If we’ve ever spoken about money, you’ve heard me mention the library many times. I think it’s vastly underrated. Here’s a whole building dedicated to providing awesome free resources to the community – how could you not love it? It’s not just for books, either. Local libraries near me offer books, audio books, ebooks, music cds, movies, book clubs, game groups, lectures, discounted and/or free museum passes, instrument rentals, study rooms, community spaces, photocopiers, reference materials, computers and printers, free internet, and more. It’s pretty awesome. I could borrow a guitar from the library, take out some books on how to learn guitar, then pull up videos on youtube to take my own lessons from home. How cool is that!? On top of that, some libraries are now in networks. My library is in a network with dozens of other libraries. If mine doesn’t have the book or movie I want, I can request it from another library and it will be sent to the branch near me, where I can pick it up and enjoy it for free! Seriously, it doesn’t get much easier than that. I can even download ebooks and audiobooks from the comfort of my living room. If the library doesn’t have something I want, I can request it and they sometimes buy what I request. If my entire network doesn’t have it, something awesome here in Massachusetts is that any resident of the state can become a member of the Boston Public Library and access their materials. If you work at or attend a university, be sure to take advantage of their library system, too. Did I mention I love the library? Date night doesn’t have to mean spending a lot of money on dinner and a movie. Instead, throw some ingredients in your crockpot in the morning and take a movie out of the library (there’s that awesome library again!) and enjoy a romantic evening at home. If you still want to get out, take a walk or go out for ice cream for dessert. Bake cookies together or play cards. Build a pillow fort. Get creative and have fun with it! Sometimes we go to the mall or a movie because we can’t think of anything else to do. Instead, try being a tourist in your town or in one nearby and be amazed at how much there is to do. Take a guidebook out of the library (the library again!) and see what’s available for free or cheap. A friend and I were stressed out and needed to get away, but we couldn’t get away overnight. So after she dropped off her kids at daycare, we took a road trip. Just 45 minutes away was a town neither of us had been to, so we figured that was as good a place as any. It was so much fun! We had a great lunch, walked around the town, got manicures, took selfies by the ocean (there’s the idea of getting outside again), and felt happy and relaxed. We came back feeling completely refreshed. Cost: $30 for lunch and a manicure – cheap for a vacation! There’s an art museum I’ve been wanting to visit, but it’s not in my budget. Lucky for me, it’s free every Saturday morning, so one day soon I’ll check out all that beautiful art for free. There’s also a show I’ve been wanting to see. Tickets are expensive, though. There are a few options. There are discounted ticket sites. There’s also the option of going to the theater on the morning of the show, especially if it’s a less popular night of the week, and seeing if they have extra tickets available for a good price. Look up your favorite activities and see what deals they have. A lot of museums have free hours each week. Local libraries often have passes for free or highly discounted museum passes. Theaters offer lotteries or 2-for-1 deals. Towns offer free movies in the park in the summer. Spring and summer bring street fairs and festivals. With a quick Google search or a visit to a business’s web site you’ll be amazed at what you can find. Life can be busy. Too busy. Sometimes it’s nice to just take a step away from it all. A day of reading, cooking, journaling, taking walks, catching up with old friends on the phone, meditating, and watching favorite movies can be downright rejuvenating. Give yourself a day away from social media and running errands and just be with you. Keep it simple and enjoy peaceful activities. That’s definitely my plan for this weekend! These 7 ideas are a good place to start, but there are so many more out there. 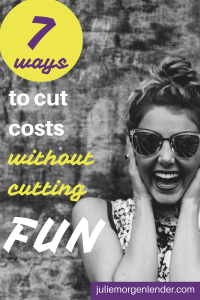 Take a few minutes to brainstorm ways to have fun without spending a lot. You might just be surprised by how many great options you’ve got. Share a few of the favorites you’ve already enjoyed in the comments and before you know it, we’ll have a spectacular list.